To make the most of your ‘Bong connection’ with the ‘City of Joy’, you need to realize that Kolkata is all about good food and gourmets who love and appreciate delicious food. However, by ‘good’ food, I mean those tasty delights that cater to your taste buds (not necessarily to your health!! 😛 ). If you thought Kolkata is all about ‘Mishti Doi’ and ‘Rosogolla’, you must definitely read this article! Hardly will you find a living being who doesn’t swear by the delectably spicy Phuchka! It is almost tops the list of the most popular Kolkata street food items that happen to be the food for the soul of Kolkata. Crispy round balls, stuffed with zesty mishmash of boiled potatoes and then, dunked in tamarind water-definitely, one of the best things that Kolkata has to offer to you! A mouthful of this Kolkata phuchka and then nomnomnom…..BLISS!!!! 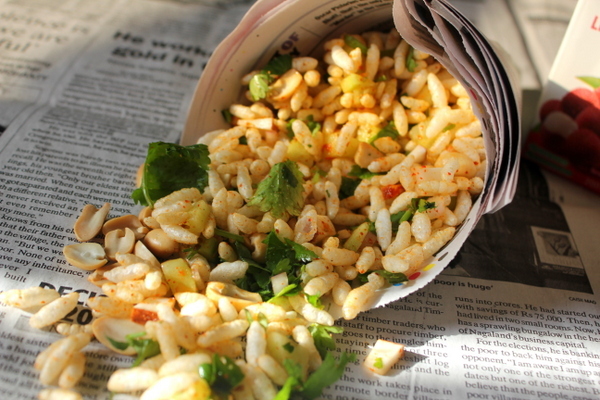 Jhalmuri is a household name for puffed rice mixed with chopped onions, tomatoes, peanuts, chillies, bhujia, coriander, spices and chanachur, with a dash of lemon/tamarind water. A light snack that jhalmuri is, it is perfect accompaniment for your adda-sessions at Victoria grounds, a quick munch while travelling in trams or just a way to bond over with your friends and siblings. If you wish to add a zest of sweet and sour sauce, opt for the Kolkata bhel puri! It is a slight variation of jhal-muri as a red sweet and sour, tangy sauce is added to your cone of puff rice. You will love it. Top tip: See that a drizzle of mustard oil is also added…after all, it is the favourite shorsher tel of Calcuttans! People in Kolkata seem to love aloo (potato) in every form, be it aloo bhaja, aloo dom or aloo kabli! Aloo Kabli is a hot favourite of every Calcuttan, be it a school kid or an office goer. This amazingly delicious snack is made out of boiled potato cubes pitched in a spicy concoction of tamarind, chillies, coriander, onions, tomatoes and chick peas. Staying in Kolkata for a while now? You must definitely try this spicy Bengali version of aloo chaat! Top tip: Insist on having aloo kabli (in an authentic Kolkata way of having it) in shaal pata! Doi Bora is the Bengali version of the well-known Dahi Vada. Vadas are deep fried and then softened by dipping into a pot of beaten curd, which is seasoned with lime, chilli powder, coriander, pudina, cumin, pepper and other such masalas. A wonderful snack to beat your hunger on the go, especially during the hot and humid summer months! Top tip: Kolkata doi bora is also about adding a generous amount of mishit doi to the tok doi, so check that out! Bengalis seem to be obsessed with ghugni. So, when you are in Kolkata, do not forget to taste this typical Bengali dish made out of dried yellow peas which are boiled and tossed with tomatoes, coriander, chillies, topped with onion, coconut chunks and tamarind water. Scoop a spoonful and put it in your mouth! Heavenly it is! Top tip: Insist on being served on a shaal patar bati! Thus, Kolkata is all about basking in the warmth of joy and loving the lip-smacking street food galore. Kolkata always has a special touch of its own, especially when it is all about its phuchka, jhal muri, doi bora,aloo kabli and ghugni! 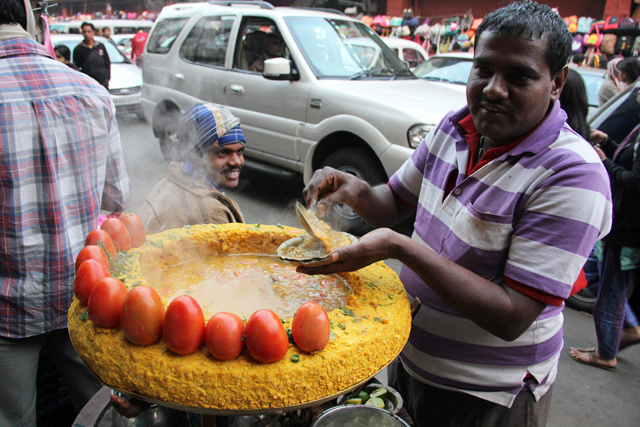 i love street food…never tried aloo kabli and it looks really interesting! Phuchkas definitely top the list!!!! Phuchka @ Dakshinapan gate is my fav. Hands down! Next story L’Oreal Paris Mat Magique All-In-One Pressed Powder in shade-”G2 Golden Ivory”- Review and Swatch.